Karen is the Chair of the Trade Marks Māori Advisory Committee (since 2003) which provides advice on trademarks that include references to Māori that may be likely to cause offence. In March 2015 she was also appointed to the Māori Patents Advisory Committee. Karen’s career spans tourism, health and the arts and is inspired by her commitment to progressing Māori development. 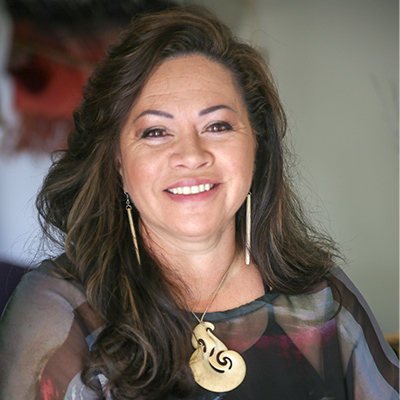 She currently works as the General Manager and Producer for Kura Productions Ltd, a Film & Television Production Company specialising in Te Reo Maori shows. With over 25 years experience as a cultural entertainer much of her early career involved promoting New Zealand and Māoridom through China, United States, Germany, and Japan, Karen also had management roles with The Rotorua International Māori Entertainers, Tarawera NZ Ltd and the NZ Māori Arts and Crafts Institute now known as Te Puia. She chaired the Māori Regional Tourism Organisation – Māori in Tourism Rotorua for 10 years and has served on national boards at key strategic levels for the industry; including the Māori Tourism Advisory Group to the NZ Tourism Strategy 2010, the Ministerial Advisory Group on Immigration, NZ Tourism Research Council and the Aotearoa Māori Tourism Federation, and the inaugural Tuhourangi Tribal Authority.